I was so excited to spot this recipe for Weight Watchers Chocolate Chip Cookies in an issue of Weight Watchers Magazine. Don’t let that close-up fool you. These are tiny. Really tiny! 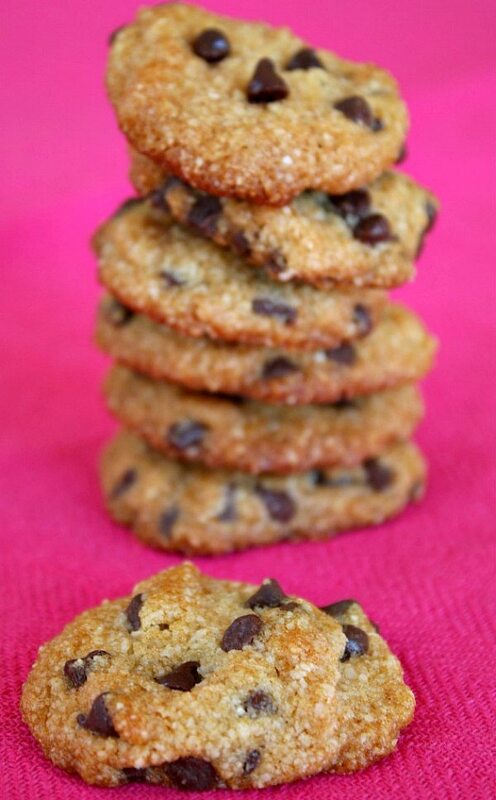 These cookies are made with two special ingredients that you may not have in your pantry: Almond Flour (which is basically ground-up almonds) and agave nectar (which claims to be a healthier, more neutral flavored alternative to honey). Both of these can be found at health food markets and well-stocked grocery stores. I was pretty shocked when I mixed the batter together- because I ended up with just about a cup of batter. How on earth was I going to get the suggested THIRTY COOKIES out of just one cup of batter?? The original recipe included sliced almonds too. I left those out since I wanted my cookies to be a little more kid-friendly. 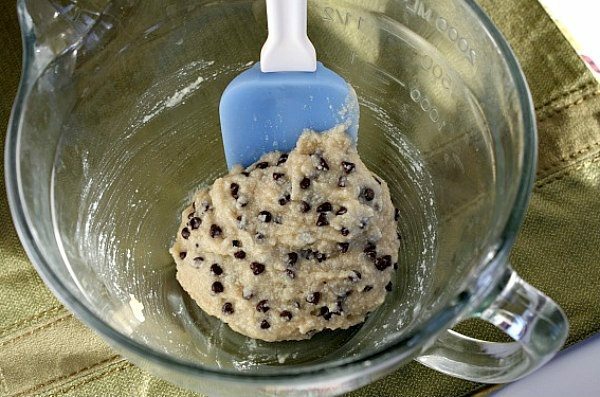 Using a teaspoon measuring spoon- and no more!- I carefully scooped out 24 little cookie dough blobs onto my baking sheets. I couldn’t have gotten any more cookies out of that dough if I tried. They turn out to be delicious little cookies (about 1 1/2-inches in diameter). They’re soft-ish but not cakey. My son took a nibble and asked about the texture… whether it was cornmeal or oatmeal he was tasting. My kid complains about almonds all the time. He doesn’t like them, yet he keeps finding them in recipes that I make… and complains. But he loved these little cookies. I’d say the flavor of the almond flour does not come through so much. 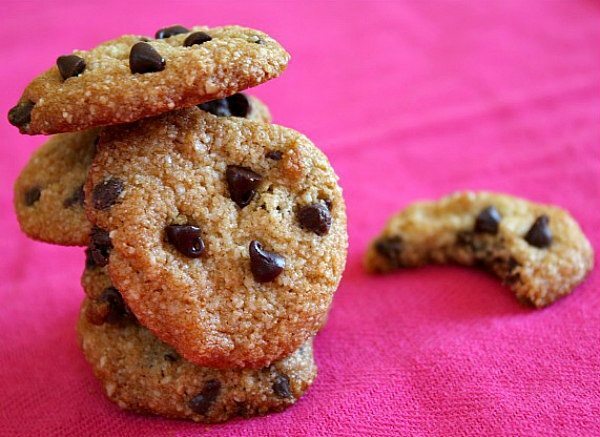 These adorable, little (healthy) chocolate chip cookies turn out to have 58 calories each. 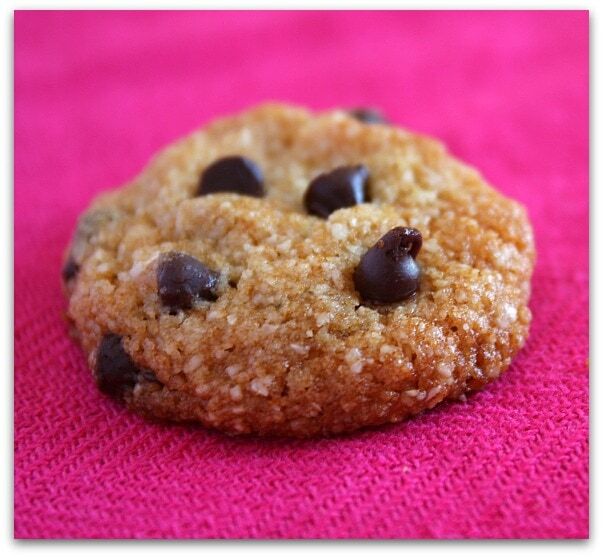 If you’re counting Weight Watchers Freestyle SmartPoints, you’ll have to count 2 per cookie. I placed two cookies per zip baggie and tossed them in the freezer for lunches and snacks. P.S. This recipe will not work using regular flour. 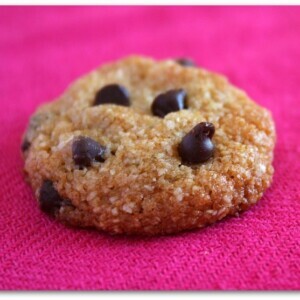 The almond flour isn’t cheap, but it will make you many batches of these cookies so it’s worth investing in some. In a medium bowl, whisk together almond flour, baking soda and salt. In a small bowl, whisk together oil, agave and vanilla. Pour wet mixture into dry and stir until blended. Stir in chocolate chips. Drop dough by level teaspoonfuls (literally- a measured teaspoon!) onto baking sheet, 2 inches apart. 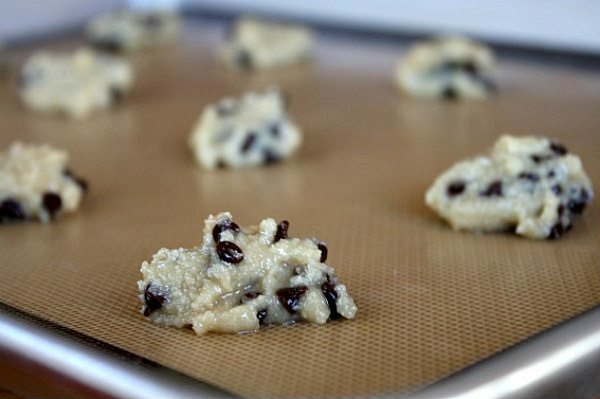 Bake 7 to 8 minutes. Let cool 5 minutes before removing to a rack to cool completely. Almond flour is simply ground almonds. It can be found in the baking aisle of some markets and in health food markets. You also might find it in markets that sell items from bulk barrels. 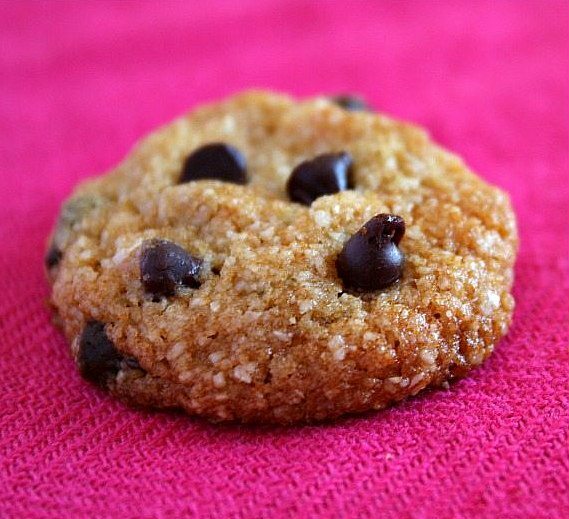 If you are preparing this recipe as gluten-free, just be sure to use brands of chocolate chips and vanilla that are known to be GF. Disclosure: There is an Amazon affiliate link included within this post.